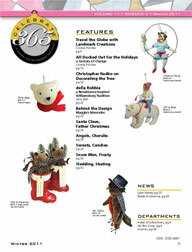 Holiday Issue 2011, It’s in the Mail! 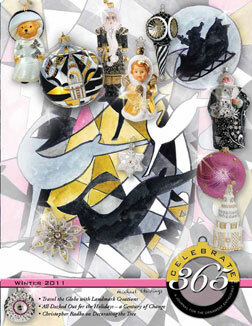 The Holiday Issue of Celebrate365 is in the mail to subscribers. To purchase your copy, please click here or on the cover image to the left. 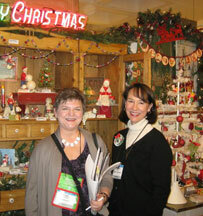 Forty-seven (47) manufacturers, designers and folk artists are featured in the new Christmas 2011 issue. See the complete list below. This Sources listing tells collectors where to find designs from their favorite designers. 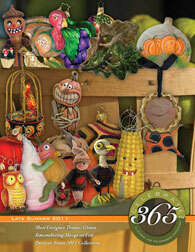 Listings include direct link to folk artists or to issue advertisers that Celebrate365 highly recommends. Author Connie PorcherPosted on December 9, 2011 December 17, 2011 Categories Allen Cunningham, Artistry of Poland, Bethany Lowe Designs, Christina's World, christmas, Christopher Radko, David Everett, De Carlini, Debbee Thibault, Debra Schoch, Eric Cortina, folk art, glass ornament, Greg Guedel, Inge-glas of Germany, Italian free blown, JingleNog, Joy to the World Collectibles, Kathie Lee Gifford, Landmark-Creations, Maggie's Memories, Michael Storrings, Nancy Malay, Old World Christmas, ornament, Patricia Breen, Teena Flanner, Thomas Glenn Ornaments, Vaillancourt, Vaillancourt Folk ArtTags Alycia Matthews, Becca Bilis, Caroline Jones, Chicken Lips, David Everett, IndigoTwin, Jenny Holiday, Jerry Arnold, Joanna Bolton, Joanne Harper, Lori Ann Corelis, Nancy Malay, Robert Brawley, Robin Seeber, Shelly Lampshire, Whimsical WhittlerLeave a comment on Holiday Issue 2011, It’s in the Mail! 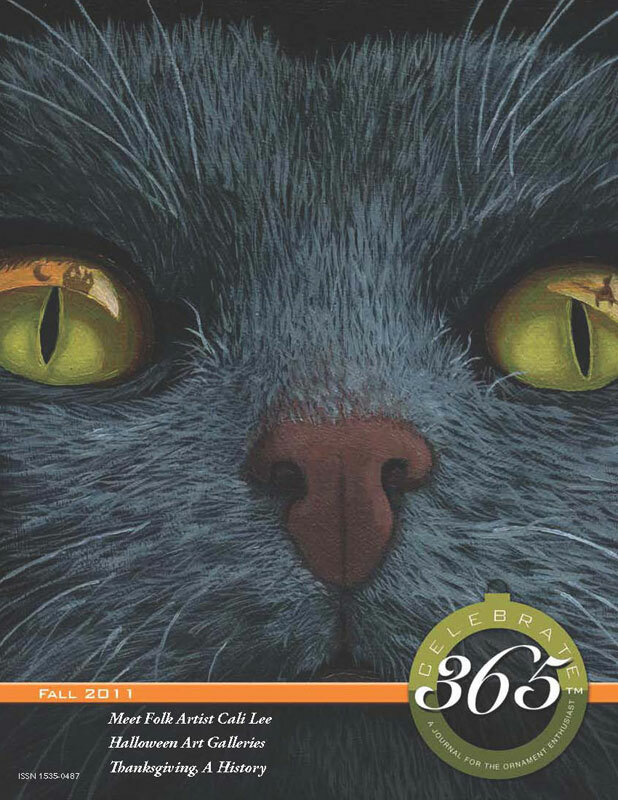 The Holiday Issue is Coming … It’s at the printer in Erie, Pennsylvania with the final proof approved today. Here’s sneak peek of the covers. Artist Michael Storrings created the art deco inspired cover illustration especially for this issue of Celebrate365. Santa flies through an art deco sky as his reindeer leap and bound, anticipating the task ahead. Non-traditional holiday hues –black, gray, white, gold, pink and fuchsia – lend a dreamlike quality and set the scene for the gift-filled morning to come. 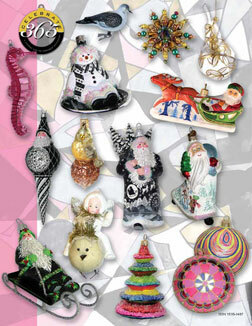 Christopher Radko writes about how to decorate your dream tree. It’s been a long time! 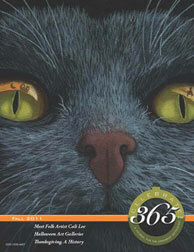 You haven’t received an issue of Celebrate365 since spring. Health issues took me away for several months. But, now we are back with a double issue. Artist Linda Apple sets the tone for Halloween! Just look into those eyes! Cat Visions leads readers into the essence of the fall festivities with ornaments and folk artists. Watch for more details to come. Author Connie PorcherPosted on September 11, 2011 Categories Allen Cunningham, Artistry of Poland, Bethany Lowe Designs, Christina's World, Christopher Radko, David Everett, De Carlini, Debbee Thibault, Debra Schoch, Dee Foust, design, eBay, Eric Cortina, event, folk art, Ghoultide Gathering, glass ornament, Greg Guedel, Halloween, Inge-glas of Germany, Italian free blown, JingleNog, Johanna Parker, Klassics by Kurtis, Lori Rudolph, Maggie's Memories, Nancy Malay, Old World Christmas, ornament, Patricia Breen, Poland, Teena Flanner, Thomas Glenn Ornaments, Vaillancourt, Vaillancourt Folk Art, Vergie Lightfoot, vintage HalloweenTags black cat, Cali Lee, Linda Apple3 Comments on It’s “Flipping” Wonderful! To purchase a single copy of this issue, CLICK here! 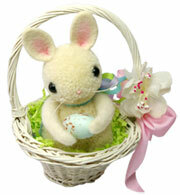 Author Connie PorcherPosted on March 18, 2011 Categories Allen Cunningham, Bethany Lowe Designs, Christina's World, Christopher Radko, Coca Cola, De Carlini, Debbee Thibault, Debra Schoch, Dee Foust, design, Easter, Eric Cortina, folk art, glass ornament, Greg Guedel, Inge-glas of Germany, Italian free blown, JingleNog, Johanna Parker, Joy to the World Collectibles, Lori Rudolph, Maggie's Memories, Nancy Malay, Old World Christmas, ornament, Patricia Breen, spring, Teena Flanner, Thomas Glenn Ornaments, Vaillancourt Folk Art, Vergie Lightfoot6 Comments on Spring is Here!